Awful strong cold easterly wind made for difficult conditions and stopped the carp feeding. 2nd on the day was Martin Eddis (Bag’em Larford) who drew peg 44 on the Match Lake. He fished soft pellet & corn down his edge to weigh 102-00-00. 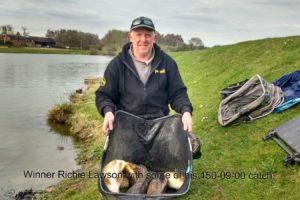 4th placed Brian Clark (Vaspe) drew peg 75 on the Specimen Lake weighing in 59-06-00 of bream to the open ended feeder. 6th overall was Neil Colcombe (Bag’em Larford) from peg 7 on the Specimen Lake weighing 52-15-00. Martin Eddis, Paul Bucknall, Brian Clarke & Perry Mountain all qualify for the Grand Master final. Mark Jones also qualifies for the Bag’em Larford Classic final too. Powered by WordPress and Pembertronics.